The Chamundi Hills loom in the background of the Gangothri Glades, and the ground is surrounded by lush greenery. Add to this the lovely weather, and a near-packed house, it was an idyllic day for cricket. Mumbai's batsmen didn't enjoy the occasion, though, as Karnataka's quick bowlers, spearheaded by R Vinay Kumar, lived up to the pre-match hype to leave the visitors reeling at 106 for 6. It was left to the famously resilient Mumbai lower-order to ensure the day was not a total write-off, Vinayak Samant's half-century hauling them past 200. Despite the pre-match talk that focused on the spicy pitch, Wasim Jaffer chose to bat. Vinay had the Mumbai captain regretting the decision soon after with a stellar display of disciplined seam bowling. The fans were still trickling in, when Vinay had Sahil Kukreja nicking the third ball of the match. Twenty minutes later, he dismissed Mumbai's heaviest run-scorers over the past few seasons, Jaffer and Ajinkya Rahane. First, Jaffer's flick was snaffled by an alert Ganesh Satish at short leg, and three deliveries later, the ball of the day - a perfect outswinger - had Rahane groping and he could only edge to the wicketkeeper. Mumbai were 20 for 3, but had the two batsmen who salvaged their first-innings in the semi-final, Abhishek Nayar and Onkar Khanvilkar, at the crease. The bowlers got the ball to jag around, but the Mumbai pair just about survived the testing spell of nine overs that yielded only 12 runs. Nayar was on all fours and needed the physio's assistance after being struck on the box and Khanvilkar was reprieved on 3 when Robin Uthappa couldn't hang on to an inside-edge that popped to short cover. Only when the fourth seamer, Stuart Binny, was introduced in the 15th over, did the batting grow in assurance. Khanvilkar confidently cut a couple of short balls for four, and punched S Aravind through the covers for another boundary. When Nayar muscled a couple of boundaries through the off side to take 12 off a Vinay over, the partnership had swelled to 64 and the recovery was well on track. Uthappa turned to his impact bowler, Abhimanyu Mithun, who got the breakthrough, first ball of a new spell. Khanvilkar's leaden-footed attempt to steer a full delivery to the leg side left his stumps splayed. Nayar was never at ease against Mithun's pace - in the penultimate over before lunch, the batsman was late to defend but escaped, only to be done in by an inswinging yorker two balls later. Soon after lunch, there was a moment of controversy. Ajit Agakar punched a Vinay delivery back towards the bowler, who dived but couldn't pull off a return catch. The ball was deflected towards mid-off where Sunil Joshi fielded and relayed the ball to the keeper. During this time, Agarkar - not interested in a single - had wandered out of the crease, practising his stroke. The keeper threw down the stumps, Karnataka appealed, and the third-umpire ruled the batsman out. Agarkar showed his displeasure to the square-leg umpire, Sanjay Hazare, when the decision was referred to the TV, and he continued to fume as he walked off. His antics only served to earn him a meeting with the match referee at the end of the day's play. Samant and Ramesh Powar started the next rescue mission for Mumbai. Both were struck several times on the hands and helmets but persevered. Powar was regularly beaten by the away movement, and on one occasion, in obvious reference to Agarkar's dismissal, he signaled to the keeper that he was stepping out of the crease to inspect the pitch. Karnataka switched their bowlers around but couldn't budge the pair for over an hour. It was time to bring back Mithun, who once again struck gold with his first delivery. He got Powar to slash to a diving KB Pawan at gully. Catching is one aspect in which Karnataka have disappointed all season, but it was top-notch today. Iqbal Abdulla played a confident cameo, slamming five fours, including three in a row off Mithun, before he fell to another smart catch, this time a leaping effort from Amit Verma at first slip. It was then the turn of Samant and Kulkarni to frustrate the home side, and the pair punished an attack whose discipline was flagging. Sunil Joshi snapped their stand at 45 by snaring Kulkarni, and Samant's resistance ended when Manish Pandey clung on to a low chance at backward point. Mumbai were disappointed to close at 233, but would have been lifted by their seamers' performance in the short spell before stumps. 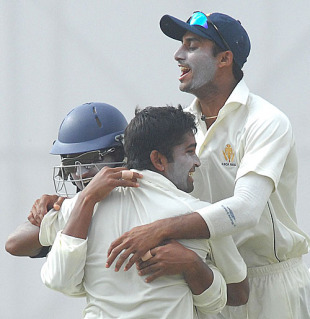 All three bowled with good pace, and Kulkarni was rewarded with the big wicket of Uthappa. The hugely inexperienced Karnataka batting has been in top form all season, but without Rahul Dravid and against a potent attack, Tuesday could be their biggest test yet.